The proximal humerus is the top portion of the humerus (upper arm bone). 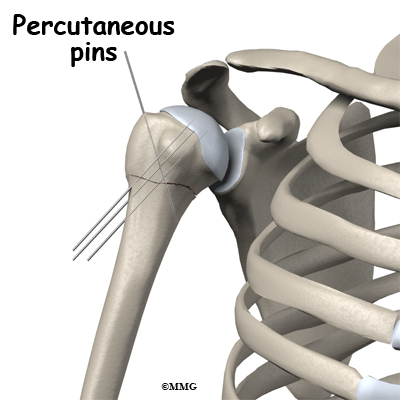 The proximal humerus is important because it forms half of the shoulder joint. 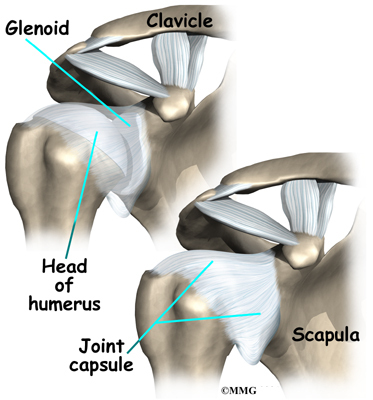 The humeral head is covered in articular cartilage (a slippery covering that allows bone to move smoothly on bone) and articulates (moves against) with the socket of the shoulder joint, the glenoid. The major muscles that move the arm (the rotator cuff muscles) attach to the proximal humerus. Fractures of the proximal humerus are important because they can damage the surface of the shoulder joint, leading to painful arthritis. These fractures can also affect both the strength and range of motion of the arm, leading to diminished function of the arm. 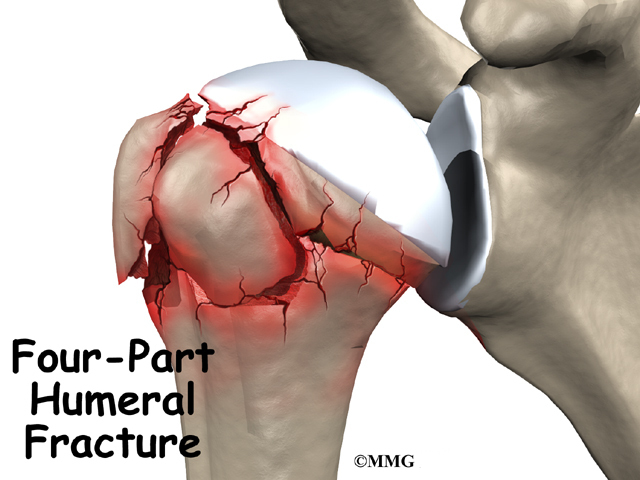 A fracture of the proximal humerus causes pain in the shoulder area. You will probably not be able to raise the arm. There is usually bleeding into the tissues around the shoulder. After several days, there may be intense purple bruising (ecchymosis) around the shoulder and down the arm. This is to be expected and you should not necessarily be alarmed. Significant swelling commonly occurs from the shoulder to the hand. You may feel the bone fragments shift as you move and you should not be alarmed if this occurs. The primary goal of the clinical evaluation of a proximal humerus fracture is to determine the fracture pattern: how many fragments of bone there are and how far those fragments are separated (or displaced). This can be determined by taking several x-rays of the shoulder. In some complex fractures, a CAT Scan may be necessary to get a 3-dimensional view of the shoulder to better assess the fracture pattern. Your provider will also want to make sure that there has been no damage to the nerves and blood vessels around the shoulder. This can usually be accomplished with a careful physical examination. The fracture pattern will largely determine whether your surgeon will suggest treating the fracture with or without surgery. Other factors will be considered including your age, general health, whether you have osteoporosis, and whether this is your dominant arm. Your surgeon must balance the risks and benefits of both surgical and nonsurgical treatment, discuss these risks and benefits with you, and choose the method that seems to be most appropriate to both of you. 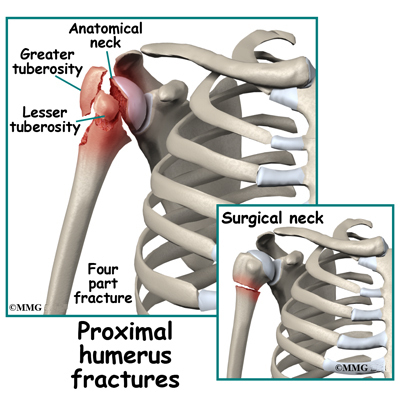 Proximal humerus fractures are commonly treated without surgery (closed reduction). If your provider makes the assessment that the fracture will heal and give you good shoulder function without surgery, nonsurgical treatment will be recommended. 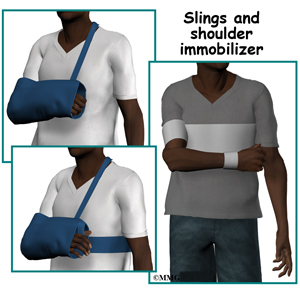 Nonsurgical treatment of proximal humerus fractures generally requires a special type of sling called a shoulder immobilizer. The shoulder immobilizer allows the arm to hang by the side and the weight of the arm provides traction that aligns the bone fragments somewhat as they heal. You may have to sleep in a recliner for several weeks. You may feel the bone fragments shift as you move; this usually stops by the third week after the fracture. Proximal humerus fractures may need surgery. If your provider makes the assessment that the fracture will NOT heal and give you good shoulder function without surgery, surgical treatment will be recommended. Surgical treatments that range from relatively simple to more complex may be considered depending on the fracture pattern. Simple fracture patterns may be treated by placing metal pins through the skin and into the bone fragments to hold the fragments in position as they heal. This procedure is done in the operating room with the aid of a special X-ray machine called a fluoroscope. The fluoroscope allows the surgeon to see an X-ray image of the bones on a television monitor and guide the placement of the pins by viewing this image. This type of surgery may be done as an outpatient. If the fracture pattern is more complex, an open operation (Open Reduction Internal Fixation, ORIF) may be recommended where the bone fragments are realigned and held together with a metal plate and metal screws. Finally, if there is extensive damage to the proximal humerus and the fragments cannot be repaired, replacement of the proximal humerus with an artificial joint surface (hemiarthroplasty ) may be required. Both of these procedures require more surgery, a relatively large incision in the shoulder, and stay in the hospital of several days. Nearly all fractures can result in damage to nerves and blood vessels, but this is a rare complication of proximal humerus fractures. 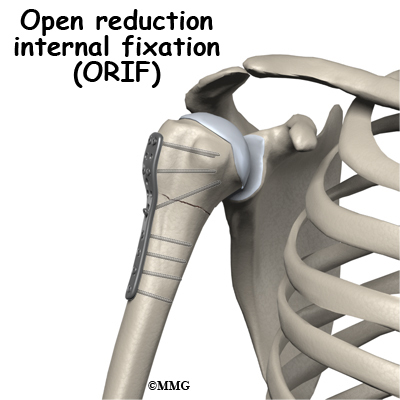 The most common complication after a proximal humerus fracture is a reduced range of motion. This can occur for many reasons including poor alignment of the fracture once it is healed or from weakness in the muscles that move the shoulder. Scar tissue around the shoulder can create restriction to motion. Preventing loss of motion is one of the key reasons physical therapy is recommended as part of the treatment of this fracture. 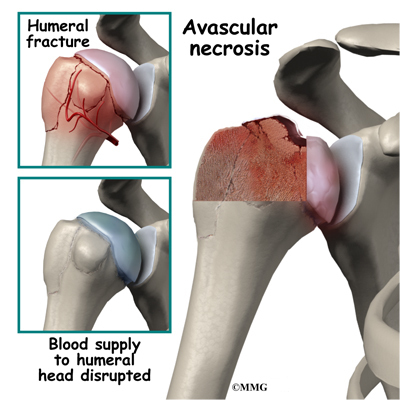 The most dreaded complication of proximal humerus fractures is avascular necrosis of the humeral head. 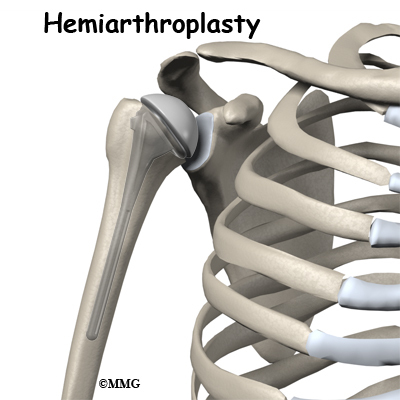 This occurs when the fracture damages the blood supply to the humeral head, the part of the proximal humerus that is covered with articular cartilage and moves against the glenoid socket. When the blood supply is damaged, the fragment may not heal and may actually collapse or fall apart. This causes the articular surface of the joint to wear away or degenerate and become painful. If avascular necrosis occurs, a second operation may be needed to replace the shoulder with an artificial shoulder replacement. The fracture fragments may fail to heal; this is referred to as a nonunion. The fracture fragments may also heal in an unacceptable alignment; this is called malunion. Both of these complications may result in pain, loss of strength, and a decreased range of motion of the shoulder. A second operation may be needed to treat the complication. Most proximal humerus fractures heal in about three months. During the first three weeks you may feel the fracture fragments shift as you move your arm. This is normal for fractures that have not been treated with surgery. 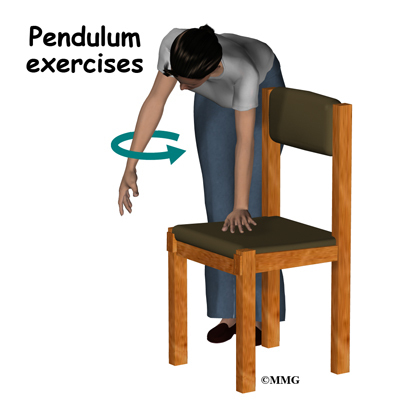 As soon as you can tolerate motion your rehabilitation will begin with very gentle exercises designed to regain motion. Once the fracture has healed enough strengthening exercises will be added to your rehabilitation program. This my occur at six to eight weeks. If surgery has been required, the rehabilitation program will be modified to protect the fixation of the fracture fragments. Your surgeon will communicate with your physical therapist to make sure that your rehabilitation program does not risk causing the fixation to fail. If the surgeon feels that the fixation is very solid, you may be able progress your program quickly; if the fixation is not so solid, the speed at which you progress may need to be slowed until more healing occurs. The prognosis for proximal humerus fractures is generally excellent. The shoulder has the largest range of motion of any joint in the body. 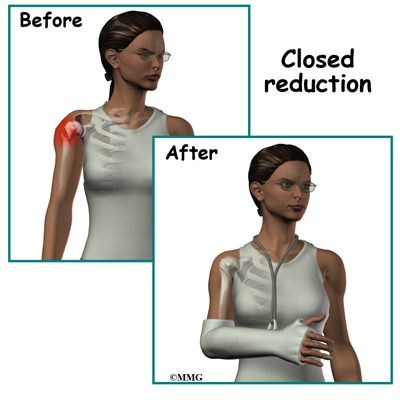 What this means if that even if the fracture fragments do not heal exactly in their normal position the shoulder joint can easily compensate and provide you with a well functioning shoulder joint.